WE CAN’T STOP WHAT’S COMING – V2 NOW AVAILABLE! Due to the overwhelming demand for vinyl editions of ‘We Can’t Stop What’s Coming’, we’ve manufactured V2. To preserve the collectors value of the more rare ‘Record Store Day’ black vinyl first edition, V2 is pressed on old English white vinyl and is minus the etchings on the b-side. To refocus attention back to what this song is really all about, and its dedication to the late Andrew Johnson, we are donating 50% of the profits from all website sales of V2 to St Nicholas Hospice in Suffolk, who cared for Andrew at the end of his life. 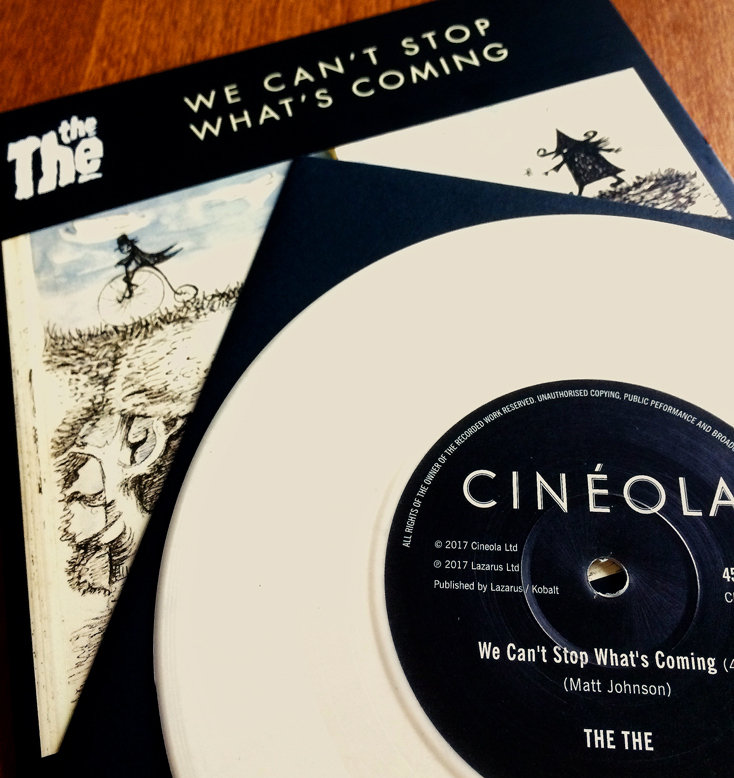 Released on Cineola, ‘We Can’t Stop What’s Coming’ is THE THE’s first new single in 15 years. Matt Johnson is joined by former THE THE members Zeke Manyika on percussion, James Eller on bass and Johnny Marr on guitar in order to pay tribute to his late brother Andrew Johnson, aka Andy Dog, who designed many of THE THE’s record sleeves and whose artwork is also featured on the sleeve of this new single. Also featured are Meja Kullersten on backing vocals, Chris Whitten on drums and Iain Berryman on keyboards. ‘We Can’t Stop What’s Coming’ is also featured in The Inertia Variations, the new documentary directed by Johanna St Michaels, which forms part of a wider forthcoming multimedia project inspired by the poem of the same name by British-born, Los Angeles based poet John Tottenham.